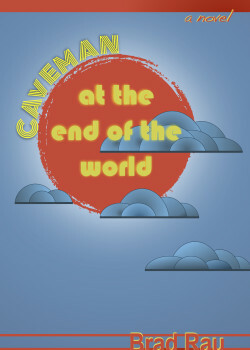 Caveman at the End of the World by Brad Rau is the story of Ella Pearson and her efforts to extricate an otherworldly yet benign intruder (“tiny, mute and covered in hair”) from her apartment and from her life. Her efforts only serve to make the problem bigger, more complicated, and ultimately a Kafkaesque swirl of personal demons inside a semi-futuristic bureaucratic labyrinth. Like Mr. Rau’s impressive debut novel, The Ghost, Josephine (which we reviewed last year), Caveman at the End of the World goes on to bring together the best elements of several genres in a story that both captivates and intrigues. The novel begins with a perfect introduction of Ella’s unique outlook on the world around her: “More than anything else, Ella Pearson revered the sun. She understood the primacy of the sun; that everything—every-last-thing-on-earth—depended on it for survival.” The author draws us in until we are completely involved in Ella’s intensifying problems, which, despite their surreal cause-and-effect, feel completely tangible and ominous. And as her world closes in more and more tightly around her, so does the sun, whose imagery spotlights Ella’s changing disposition: “The sun should have been on him by now, but the day was gray and wet and the bonsai sat in gloom.” And: “No wonder she enjoyed the sun so much: she was from farming stock.” And: “Ella woke, panicked about the sun; worried that if it didn’t rise, she would never wake.” And: “Under that concentrated blaze of sun, Ella felt suddenly awake and focused and at ease. It’s just the sun, she reminded herself—it has nothing to do with this place.” And: “The Gish Sunset was perfect—better, she thought, than a double dose of Represitol.” And: “Outside, the sun seemed like the eye of authority, aimed more squarely on Ella than on anyone else.” And: “On the distant skyline, the sun was squashed, flattened out, sharpening and flaring in a last, dying exertion.” And, finally, in the end: “Under the wide, blue sky, under the nurturing warmth of the sun, even in spite of the dark taint of her dreams, Ella wasn’t convinced there had ever been a better, brighter day than this.” Rarely does a novel succeed in giving its readers such a brilliantly illuminating window into the hero’s soul with a more perfect tool. In summary, Caveman at the End of the World delivers a superbly original story that moves along with lifelike action scenes, shocking twists and turns, and nail-biting all-consuming suspense. The novel features a genuine and believable protagonist who earns our deepest care as she contends with a sequence of harrowing events. It successfully converges themes of human origins, transformation, and existential meaning with artificial intelligence, futuristic menaces, apocalyptic survival and the great mystery we all attempt to solve daily: Who are we, why are we here, and where are we going? Highly recommended!